TESSERAMENTO 2019 – LEGAMBIENTE BOLLATE INCONTRA SOCI, AMICI E SIMPATIZZANTI. IL CIRCOLO LEGAMBIENTE DI BOLLATE INCONTRA SOCI, AMICI E SIMPATIZZANTI. 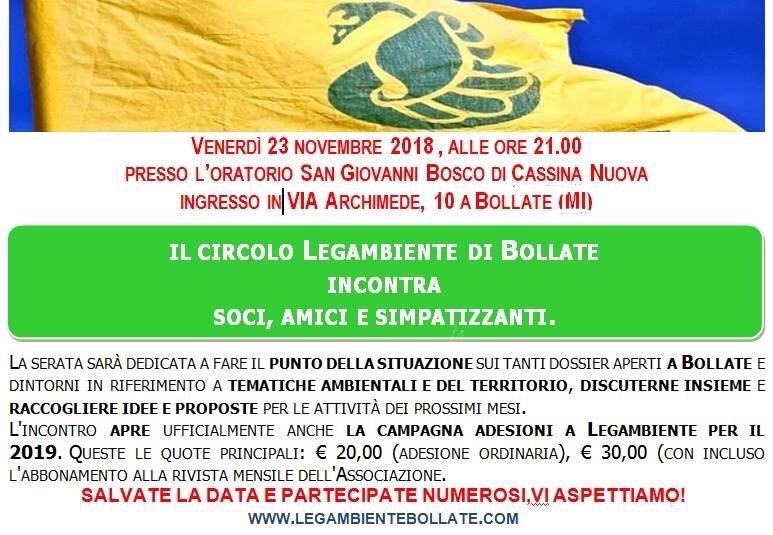 LA SERATA SARÀ DEDICATA A FARE IL PUNTO DELLA SITUAZIONE SUI TANTI DOSSIER APERTI A BOLLATE E DINTORNI IN RIFERIMENTO A TEMATICHE AMBIENTALI E DEL TERRITORIO, DISCUTERNE INSIEME E RACCOGLIERE IDEE E PROPOSTE PER LE ATTIVITÀ DEI PROSSIMI MESI. L’INCONTRO APRE UFFICIALMENTE ANCHE LA CAMPAGNA ADESIONI A LEGAMBIENTE PER IL 2019. QUESTE LE QUOTE PRINCIPALI: € 20,00 (ADESIONE ORDINARIA), € 30,00 (CON INCLUSO L’ABBONAMENTO ALLA RIVISTA MENSILE DELL’ASSOCIAZIONE. SALVATE LA DATA E PARTECIPATE NUMEROSI, VI ASPETTIAMO!